It is not wise to criticize people since they may easily criticize you in return. درست نیست بقیه رو مورد انتقاد قرار بدی چونکه اونا هم همینکار رو با تو میکنند. کلوخ انداز را پاداش سنگ است. You reprimand me for being careless with my kids! Don't forget about your naughty kids. 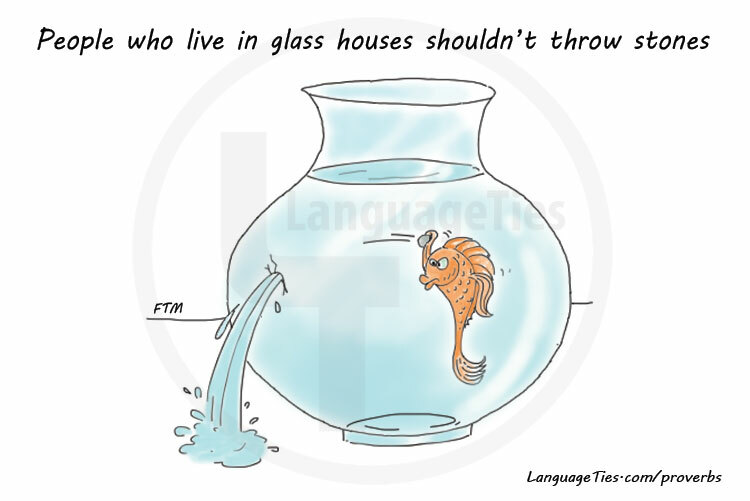 People who live in glass houses shouldn’t throw stones. When there is an opportunity to do something, you need to be quick in taking advantage of it and should not act slowly. وقتی فرصت انجام کاری فراهم می شود، باید زود از فرصت استفاده کرد و نباید تألل نمود. come on, tell them that we want the last ticket before it is sold out! You must have forgotten that he who hesitates is lost.